My last article was a quick introduction to the litecal module. In this article, I’ll show how to go further with Litecal to create more complete user interfaces. You’ll see how to use associate related events by colour, how to add additional displays of the same data, and a few tips on themeing Litecal. Most of us are familiar with programs like iCal which use colour “link” related events together on a calendar. One way to make a Litecal-based view immediately more usable is to implement this technique. Thankfully it’s rather easy to do thanks, once again, to Development Seed and their Seed module. Seed contains useful code and customisations for Litecal and a number of other modules. The name suggests that it’s intended for semi-internal use (maybe just Open Atrium, I’m not sure), but it’s GPL and the awesome people at DS released it so I don’t feel too bad in making use of it. Do the usual dance of downloading, unpacking and installing the module from the link above (Seed depends on Context, so install that too). Once that’s done, you’ll need to return to the view you created in the last article. Go back and edit your calendar. Select the Calendar display, update the Style options and change Color by to field_event_location_value. Once you’ve updated (or saved) the display, Litecal will use Seed to assign a colour to each event displayed on the calendar based on the value of the location field. Events at the same location (where “same” means “has the same CRC32”) will have the same colour! Seed only supports 16 colours but this should be enough for most purposes and the colours themselves are easily overridden in your theme stylesheet. As great as this is (and you’ll have to agree, it is pretty awesome) there are a few little niggles. First, when Seed is installed Litecal might get confused and fail to render events in the Live Preview (this might just be Theme Developer, though). Second, Seed doesn’t just add support for colours to Litecal; it also overrides the user picture template and a bunch of other stuff that you probably want left alone. Third, it’s adding Context for no particular reason (at least in this demo). I’m still a bit puzzled by the first issue, but the others are readily solved by pulling the colouring code out of Seed (look for the theme functions with crayon in their names) and whacking it in another module, but you’ll also need to tweak the code of Litecal (look for the module_exists('seed')). I hope that this colouring functionality will be merged into Litecal itself at some point, or at least pulled out into a module that doesn’t do a bunch of other stuff too. A calendar by itself is great for little things – “Yes, I’m free on Friday 13th” – but might not be enough in cases where users need more complete information at a glance. 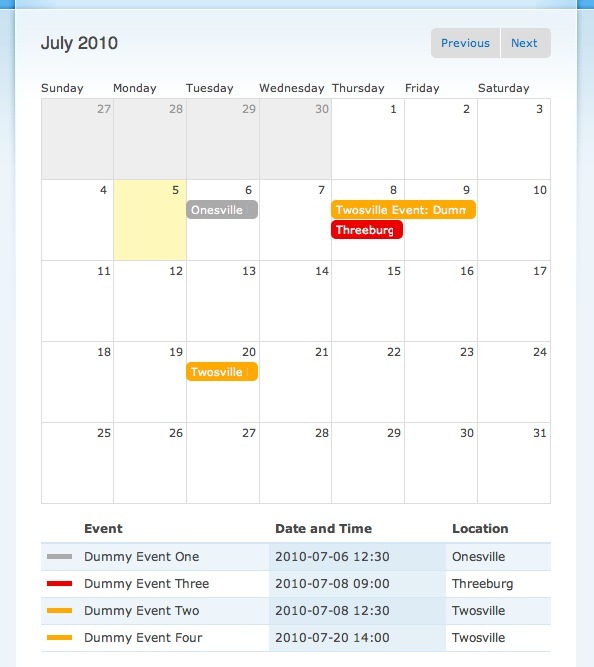 That’s why so many calendar applications also display events in a list or table view. With a pretty feature-full calendar, this list view is next on the list! The goal is to add a table with the most pertinent details about each event below the calendar display. Having though of just this combination of use cases, Views makes this an absolute cinch. Go back to your view and add a new Attachment display. Change the name of your new display and override the Style, setting it to Table (sorted by the Date field). Inherit arguments should be yes (so that the table displays the same month as the calendar). Postition should be After (it’ll look a bit odd before the calendar). Attach to the calendar display you created in the first article. Add Sort criteria in the Default display so that the events are sorted by Content: Date in ascending order. This might help keep things consistent in the event that you need to display the pager. Add Filters on Date: Date (node) to list only upcoming events in the table (those where To date is greater than or equal to now). Using Panels instead of attachment Views to link the table to the calendar. This makes using the pager slightly simpler. Given that it’s called “Key”, it’d be nice if the table display was actually a key for the calendar display. You can add a column with the same colour as is used in the calendar quite with a simple change to the view and a less simple change to your theme. If you looked at the colouring code in Seed and the way it’s invoke from Litecal, you probably noticed that it’s fairly simple: get the “key” value, feed it to the colour picker code (theme('crayon', $key)) and use the result to add a class to the element. If you followed the instructions above, your calendar entries are colour coded according to the location field. To add the correct colour to the table, you’ll need to add a new column containing this value and then use the theme layer to turn this into a coloured splotch. Edit your “Key” display and add a new Content: Location field. Re-order the fields and move this new column to the top of the list as you want the colour-coding to be the first item in each row. Save that and then load the view in your browser. Using whatever inspector tool your web-browser provides (or “View Source” if you’re a sadist), determine the [longest] class on the cells in the new column. Mine is: views-field-field-event-location-value-1. where <prefix> is your theme name (or theme engine name), <view_name> is the name you assigned your view when you created it, and <field_name> is the name used in the class above (but with _s instead of -s). // table cell if we weren't messing with things. This post was published on July 6, 2010 and last modified on April 4, 2019. It is tagged with: drupal, views, calendar, litecal.